The term “Critical Thinking” has almost become trite as it has become one of the most overused buzz-words in education. It is a great thing to teach someone how to think deeper. It is wonderful to see people question the how, where, when, and why something is done in order to get to the true answer. I wish we were all better at this. However, there is a dark side to critical thinking. This is where someone has to criticize, berate, tear down, minimize, and basically trash the thoughts, aspirations, and accomplishments of others. This type of critical thinking stinks, and yet it seems many people have settled for having a shallow mind instead of deep thinking. Pretty sad, wouldn’t you agree? It is easy to have a critical attitude when it comes to politics, religion, and relationships. They are all easy targets. It reminds me of the pot-bellied guy sitting in his easy chair watching the ball game and trash talking how the quarterback is a loser…and this guy never played Peewee Football much less in the NFL. Having a critical attitude seems to be contagious too. Just go into a staff meeting and start spreading a juicy rumor about someone and see how it spreads. People seem to thrive on gossip…and not the good kind. When you settle for having a critical attitude, you have gone from being a realist to a pessimist. You probably use the excuse that you are just calling it “real.” The problem is that the vile you spew is self-evident. Why do you feel compelled to tear someone else down? It does not make you bigger in the eyes of others; just the opposite. You are only fooling yourself if you believe that lie. I have come to the conclusion that people do this because of their own insecurities. They feel compelled to tear down others in a sick way so they may somehow feel superior to them in their own mind. Pretty twisted way to think, and yet it is done every day in countries around the world. Some days my biggest accomplishment is holding my tongue and not saying what I think. You can’t be a deep thinker if you stay in the shallow end of the pool. Let’s aspire to positive critical thinking and learn to elevate others. This is what we need to master as adults and teach the kids. 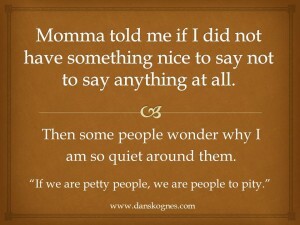 If we are petty people, we are people to pity. Critical Thinking by Dan Skogles is licensed under a Creative Commons Attribution 4.0 International License. Based on a work at http://danskognes.com/critical-thinking/.